Take a walk on the wild side with this gorgeous animal printed dress. Cut to an oversized fit, this relaxed dress is perfect to dress up or down for whatever occasion. Complete your look with black over the knee boots and tote bag. I love this dress! Very “on trend” for autumn. Fits well & skims over any lumps & bumps in the middle. Length on me (160cm) just below knee. Handy pockets & best of all pull-on. No messing with zips or buttons. Dress up or down. A lovely easy dress to throw on & go. I am pleased with the dress, I like the shape and the length for me at 5ft 2 ins is perfect. If I am honest I would have liked a heavier fabric, it is a bit thin and it does cling if you wear with tights, but I will deal with that. Fabulous !! Good fit , can dress up or down ... I bought a size 12 , I hope this is helpful for those ladies of a certain age. ?? ?? I would recommend this dress. This dress you can dress it up or down . Absolutely love it, i wore it last night and it looked and I felt great. It is so comfortable to wear, I have just washed it and it looks like it's never been worn. I hung it on an hanger and it dried within the hour. I’m a size 12. Fits perfectly. Length just above knee, I’m 5.6. Quite roomie but still flattering! Very pleased with this dress. It will look good with opaque tights and boots and in the summer. I’m a 10/12 but had a 10 as it’s a loose fit. A lovely dress that can be dressed up or down. A great addition to my wardrobe. Pleased but expected it to be a bit thicker material, I'll need to wear a slip. Nice comfortable easy to wear dress. This is a very comfortable dress to wear and hides any bumps you might have. I would have liked it with long sleeves as well. A Dress to Impress !!! Bought for my 21 year old daughter , she loved it!! 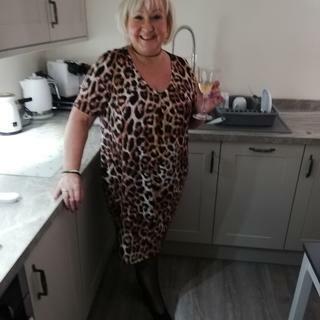 Wore it for work in a busy estate agents and got lots of comments on how nice it was, said its very comfy and she would wear it for a tea time drink to, we bought a size 12 and it was perfect, room to move about!! Keep doing what you do!! Very nice material and finish- washes lovely, put it on a hanger to dry and no need to iron- no creases!! Knee length, lovely soft fabric. Bought a size smaller from usual as recommended by other customers and it is a perfect fit. Hi fab dress good fit would recommend to friends. I am quite busy and fits great. Length is good too can't wait to wear. Love this dress bought it in brown and the black I wore as a dress but will also wear with leggings as a tunic or tucked in jeans and rouched over. Can wear casual or dressed up. I did go a size smaller 14 instead of 16 as advised which was great. I was worried about the sizing tbh but I ordered my usual size. It came in 5 days, I took it out of the bag and it wasn’t even creased.. I tried it on... perfect. It feels lovely , soft material, hangs well , good length. I’m so pleased with my new xmas dress. Will certainly order more items. Beautiful dress, good quality, flattering, comfortable anf a excellent price! Very nice dress. Easy to dress up or down. Looks good with black opaque tights. Perfect fit, as described in the information. Dress arrived on time. Looks great with black tights and boots but would also work as summer dress I think. A bit clingy but well sized. Would definitely be buying from Romanoriginals again. The dress fits perfect and I love it. It looks great with tights and ankle boots. This dress was a perfect fit and feels beautiful to wear with either shoes or boots. lovely dress, nice loose style, will wear it on holiday. Arrived within a few days. Love this. Have one in green too. Great for smart workwear but also parties. Product was just as described. Considering another one with longer sleeves! I love it. Casual worn with flats or dress up with knee length boots or pair of heels as I did. Well chuffed with how it looks on and being a curvy 16 it hangs perfectly. Comfy and.....IT HAS DEEP POCKETS! Who doesn't want a dress with pockets?! Leopard Print Dress that is so on trend! The Animal Leopard dress is really comfortable to wear. The material is light however, it has a warm feel to it. Absolutely love this dress, the cut is really flattering and it's the perfect length. I can't wait to wear it now with my new knee high boots.. was made even better that I received 20% off. I would also like to add that it was beautifully packaged, so overall can't fault anything. Love it! So comfy and stylish. Great with skinny jeans or leggings. I'm a size 14/16 what size should I get ? BEST ANSWER:Our clothing is true to size. As this dress is purposefully oversized and relaxed fitting, we would recommend a size 14. Is the dress suitable for mature Ladies? BEST ANSWER:This dress is most definitely suitable for mature ladies. Take a look at our reviews to see what customers who bought this think. How long is the Black Friday discount on for? BEST ANSWER:The Black Friday sale is only for a limited time and will be ending in the next couple of days. I am a size 12 to 14 does the dress come big? BEST ANSWER:This dress is a slouch style and so has a more relaxed fit. Below are the approximate measurements for both of these sizes to help your choice. What is the sleeve length on the brown dress the red dress has longer sleeves but description states 3/4? BEST ANSWER:The brown and grey animal print dresses have short sleeves whereas the red has 3/4 length. The sleeve length of this dress is between 23.4cm and 26.4cm depending on size. BEST ANSWER:This dress features a relaxed fit so we would advise a size 12 for an accurate fit but if you wish to be extra comfy, go for a size 14. Never sure what size to get I am a 12 in your tops but wondered what size to get in the dress ? BEST ANSWER:We would advise to get your regular size but yes keep in mind that this dress has a relaxed loose fit. BEST ANSWER:The delivery period is between 3-5 working days. What are the sizes like on this dress? BEST ANSWER:The style of this dress is a relaxed fit however the sizes are true to size. I normally buy an 18 in scuba dresses as I m big on top but i always have to have them taken in. Will a size 14 Fit me?? BEST ANSWER:We would advise to go one size down if you wish to be more comfortable but it all depends of your body shape and how you feel. Feel free to try different sizes and send the wrong ones back. Why don't you make the clothes in larger sizes? Up to 25/26 would be great! BEST ANSWER:Unfortunately we only stock sizes 10-20. What size bust is the 14 please ? BEST ANSWER:A size 14 bust is 103cm. BEST ANSWER:A size 12 in this particular dress measures approx. 112cm on the waist and approx. 118cm on the hips.